There is just one word to describe these cookies: ridiculous. In the best way possible, of course. 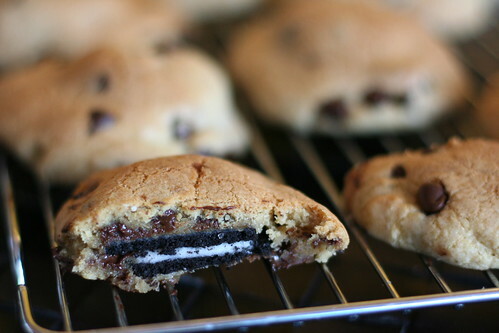 A cookie within a cookie is just pure genius. Like, a "why didn't I think of that?" kind of genius. Luckily for all of us, Jenny at Picky Palate did think of it, and I'm here to vouch for her recipe. If you want to make something completely over-the-top and indulgent that is sure to impress your friends (and even your enemies), you should consider making these cookies. That's really all I have to say about that. 1. Preheat oven to 350 degrees F. In a stand or electric mixer, cream butter and sugars until well combined. Add in eggs and vanilla until well combined. 2. In a separate bowl, whisk together the flour, salt and baking soda. Add flour mixture to wet ingredients in 3 additions until just combined, then stir in chocolate chips. Using a cookie scoop, take one scoop of cookie dough and place it on top of an Oreo in your palm. Take another scoop of dough and place it on the bottom of the Oreo. Seal the edges together by pressing and cupping in your hand until the Oreo is enclosed with dough. 3. Place onto a parchment or silpat lined baking sheet and bake 9-13 minutes or until they reach your preferred doneness. Let cool for 5 minutes before transferring to a wire rack to cool completely. Enjoy! wow, these look fantastic! will have to make, for sure! :) thanx for the recipe! Shut the front door these look AMAZING!!! WoW! I think I will try these for my little friends! I think I will become a huge favourite! OMG. There should be little dispenser machines scattered over the city that pop these 2-in-1 oreo cookie babies out in seconds...I <3 these cookies. This looks devine! I'm going to have to try it one of these days. I know for a fact that my husband and other family members will just LOVE this. Thanks Amy!!! I hope you are enjoying Dubai! These cookies are incredible! I made them today and they came out perfectly (a little bigger than I expected but amazing none the less). I will definitely be making these cookies again! These cookies were so good that I had to freeze them to stop eating them. Then I ate them while they were frozen solid, so I had to give them away. They are delicious!